Today's competitive and fast-paced business environment requires that more people have access to real-time performance and status information, so they can make quick and intelligent decisions. The need for timely and succinct business intelligence continues to grow as executives demand critical information to seize opportunities faster than competitors and to address potential problems in the making. C-level executives and upper management aren't the only staff needing access to business intelligence. Business unit managers and rank-and-file personnel increasingly must also have updated information to do their jobs. 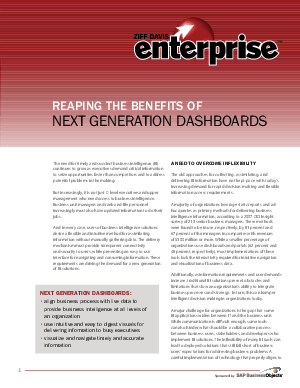 This white paper discusses the features and benefits of next generation dashboards.